Live broadcast at 11am London time (which is midday in Paris and 1pm in Istanbul and Moscow). This 40 minute webinar will provide a preview into the ideas at the heart of Mark’s new book. 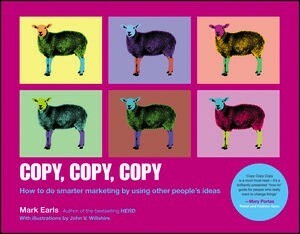 Previous books by Mark and colleagues have argued that copying is a central heuristic in human decision making of all sorts and the key mechanic behind the spread of ideas and behaviour. CopyCopyCopy applies this lens to the business of innovation and insights. How to use Kinda questions to find new and interesting solutions to copy from far, far away. Examples include Elvis, the British Olympic Cycling team and Great Ormond Street Hospital.